Ok, so the concept is good. I like the box that it comes in (I mean, purple tissue paper, you are speaking to my soul). I like the idea of going onto the site each month (they send you a super helpful reminder email when the sample selection period is open) and choosing specific samples that I want to get. The downfall comes when you’ve filled out their (pretty intensive) profile and clearly stated that you are interested in makeup, nail polish, etc. 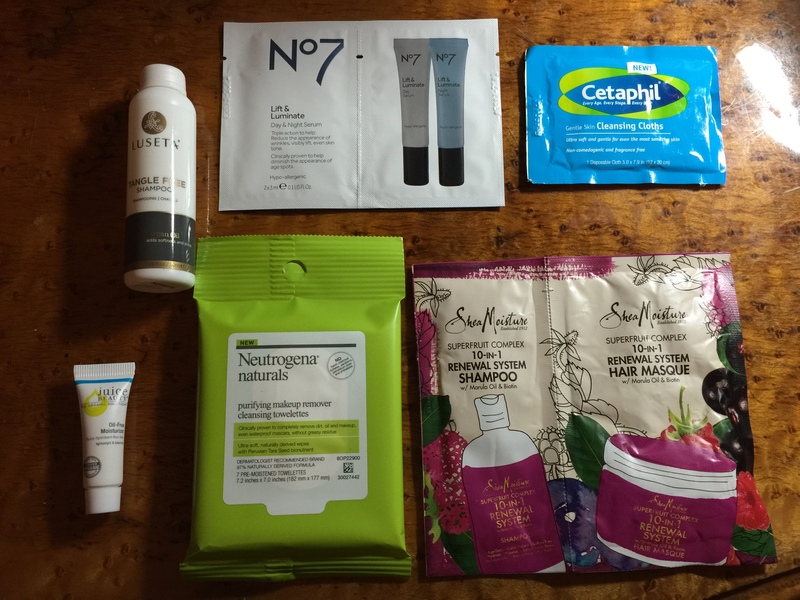 and (no exaggeration) every single sample choice is either skin cleaners/moisturizers, shampoo, or random things like chocolate mint tea. There was only one (1!) item on my available list to chose from that I was even remotely interested in and it’s been this way every time I’ve chosen samples. Also, it’s not a huge choice list. It is maybe 12-13 each time. Box #1, never came. Box #2 went to the old address (oops). Box #3 just arrived (this review is of it). Box #4 just had it’s sample choosing window and it was the same drill. 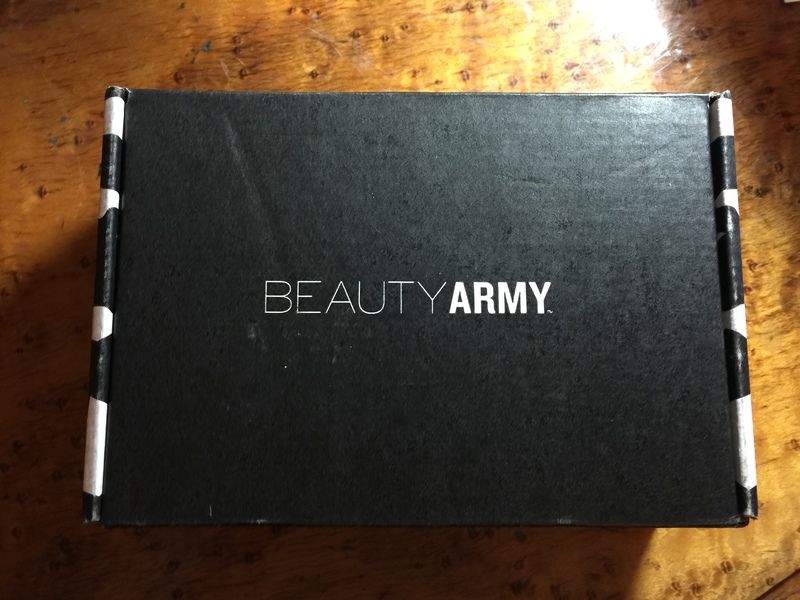 Juice Beauty Oil Free Moisturizer – Eh, I can take it or leave it. It’s fine. Doesn’t really smell like anything and didn’t tell any difference from using it or Jergen’s which is my default after cleaning my face. Lusera Tangle Free Shampoo – This peaked my interest because tangle free is a high claim with my hair. It was a decent sized sample (probably enough for 2.5-3 uses to the normal person which meant that it was actually enough for one use for me). Again, didn’t really smell like anything (which is fine, I’d rather that then something that smells like chemicals), but the blow was that there was nothing Tangle Free about it. Not while washing/rinsing in the shower. Not while drying it. Not while brushing it afterwards. Nothing. So…that goes into the ‘Don’t buy again’ list. 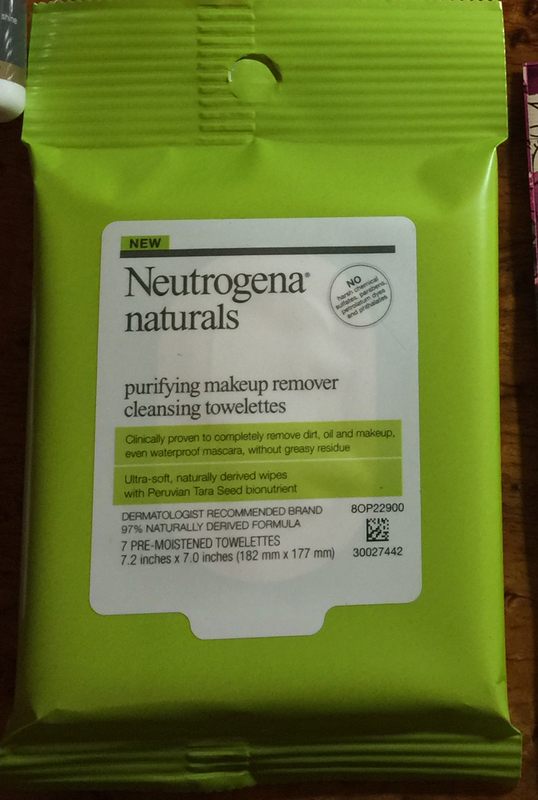 Neutrogena Naturals Makeup Remover Towelettes – This is the one item that I was happy to chose. I love these things. 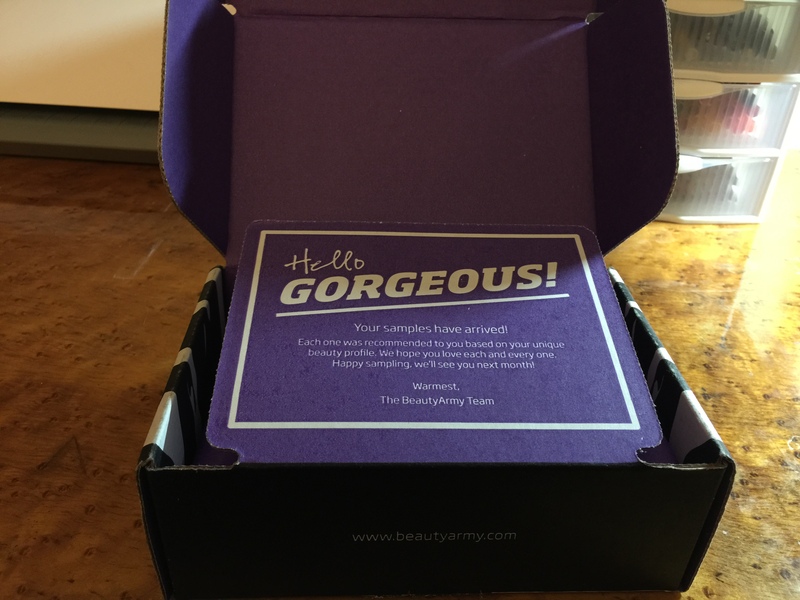 So convenient, great for business trips (This sample was 7 cloths), they work well and aren’t too harsh on my skin. I buy these in the normal quantities. 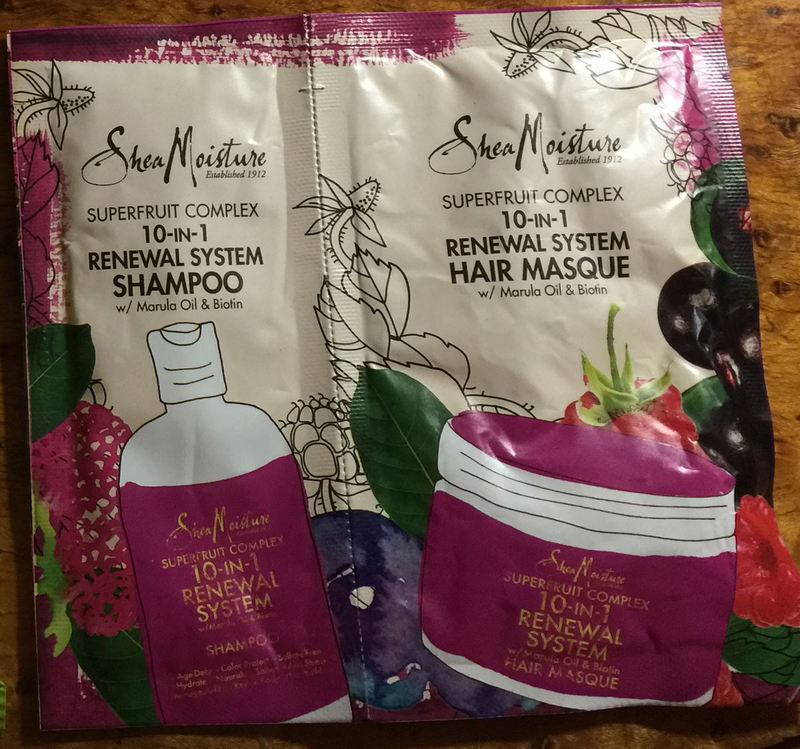 Shea Moisture Shampoo and Hair Masque – First off, this company makes amazing smelling products. I have their Black African soap and I love it. This was no exception. Smelled great. The problem came in that the amount you get isn’t enough to do anything with. I know I have super thick hair, but this was ridiculous. Squeezing every last bit out that I could (not particularly an easy thing to do in the shower, at least I remembered to cut it open with scissors before hopping in because there was no way it was tearing…) only gave me about a quarters worth of product in the palm of my hand. 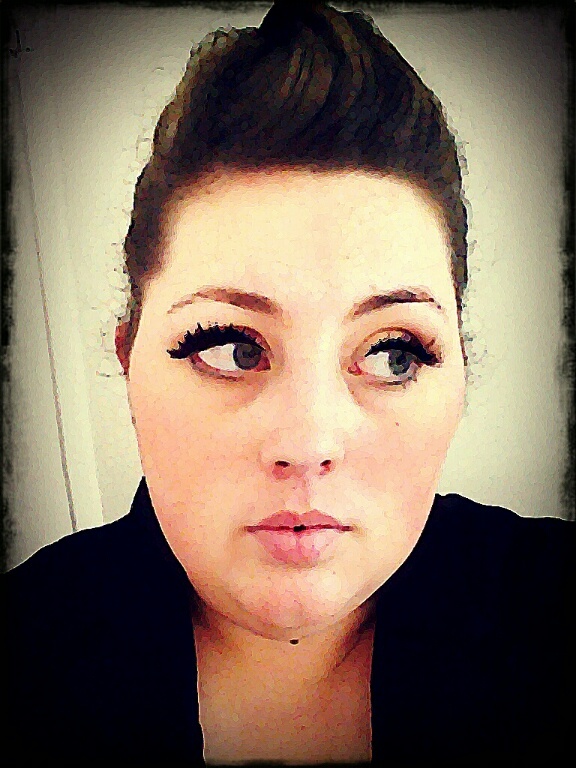 That covers approximately the top 1/16th of my head. 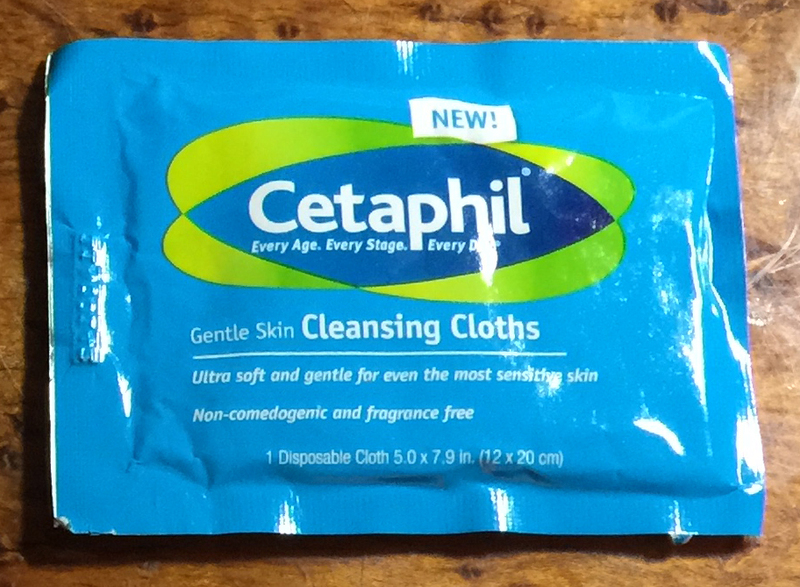 Cetaphil Cleansing Cloths – I got these because I figured, if I had to get something else, at least I could take these with me when I travel. I’ve used the Cetaphil lotion before and it didn’t cause adverse reactions with my skin so I am assuming these will be ok as well. 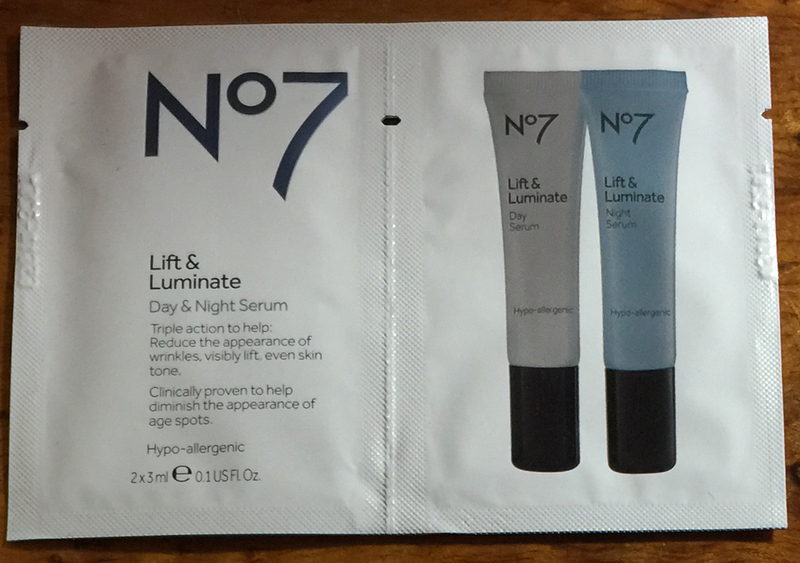 No7 Lift and Luminate Day & Night Serum – Well, maybe if there was enough for more than one application I could test over a week their claim to ‘reduce the appearance of wrinkles, visibly lift, (and) even skin tone’…alas, no change in skin tone that day. So, it will be interesting to see if the sample choices get any better. I’m not holding my breath.